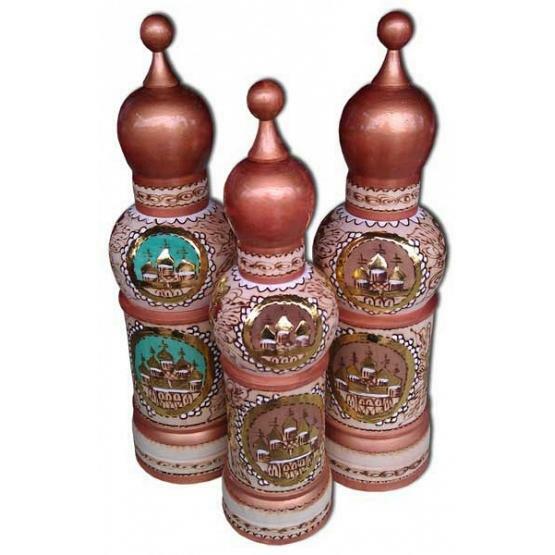 As all of our wooden bottle cases (holders), this item is handcrafted in the heart of Russia. It is hand-turned from linden wood and then hand-painted by a professional artist specialized in painting on wood. This bottle case opens in the middle to fit a standard 0.5 liter vodka bottle or a bottle of similar size. May also be used as a treasure box. The bottle case is coated with 3-5 layers of crystal clear lacquer, and would make a great gift and/or a nice addition to dining accessories in your kitchen. Ships from Moscow within 7 business days. Price per item. Color may vary.